William Merritt Chase was born on November 1, 1849 to Sarah Swaim and David Hester Chase in Williamsburg, IN. At a young age, Chase took informal drawing lessons from his grammar school teacher. In 1861, his family moved to the burgeoning city of Indianapolis where Chase became a student of self-taught painters Barton S. Hays and Jacob Cox. Upon the advice of Hays and Cox, the twenty-year-old Chase moved to New York to become a student of portrait painter Joseph Oriel Eaton. After a brief period of study with Eaton, Chase enrolled at the National Academy of Design (NAD) and studied under Lemuel Wilmarth, who was once a student of the French artist Jean-Léon Gérôme. Seeking to help his family out of financial problems, Chase entered the professional sphere and left New York for his family’s new residence in St. Louis. Once in St. Louis, he became well-known for his commissioned portraits and still lifes. In 1871, three of his paintings including Still Life with Fruit were exhibited at the National Academy of Design. Local businessmen soon took notice and funded a trip to Europe for the promising young artist. After spending a brief period in London and Paris, Chase traveled to the Bavarian capital of Munich where he enrolled at the Royal Academy in 1872. During his time at the Royal Academy, he established lifelong friendships with the American artists Walter Shirlaw and Frank Duveneck. Together, these artists dominated the American circle in Munich. In America, Chase’s art was also meeting success with the exhibition of “Keying Up”- The Court Jester, which won a medal at the Philadelphia Centennial Exposition of 1876 and later received critical acclaim at the National Academy of Design exhibition of 1878. After his studies, Chase traveled to Venice with Duveneck and the artist John Twachtman. In 1878, Chase accepted a teaching position at the Art Students League in New York. This was the first of many instructing efforts that Chase would pursue in his lifetime. He would go on to teach at the Brooklyn Art Association and the Pennsylvania Academy of Fine Arts. In the summer of 1891, he opened his own Shinnecock School of Art, which offered a summer program for artists. However, Chase’s most influential endeavor was his opening of the Chase School of Art in Manhattan, which would later become the parent institution of Parsons the New School for Design. In his years as an instructor, Chase trained generations of painters and is credited as one of the most important art teachers in America at the end of the 19th century. He is rivaled only by fellow American artist Robert Henri. Though his dedication as a teacher was time consuming, the flamboyant Chase never lacked the time to frequent the circles of New York society. Through introductions made by the painter Frederick Church, Chase met Alice Gerson, who would later become his wife and mother of their eight children. 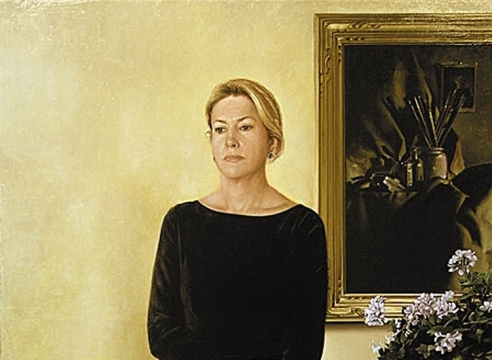 Though seventeen years his junior, Alice was a devoted wife who understood Chase’s visionary role in the art world. When his good friend and fellow painter John Twachtman died in 1902, Chase became a member of “The Ten American Painters,” which cemented his role in American art history. His bohemian studio in the famed Tenth Street Building became the hub of the New York art world. Decorated with exotic and lavish objects, his studio reflected both his character and painterly style. During the later years of his life, Chase’s interests in teaching took precedence over his own career as an artist. He often made trips to Europe with his students, and above all, he encouraged them to strive for “Truth, quality, and interesting treatment” in their art. He died on October 25, 1916 in New York. Far from “typical,” Chase’s art is bold, eclectic and even poignant. His most famed landscapes of New York capture the nervousness and vibrancy of the city, yet they are crisply rendered and are referred to as “little jewels.” Chase is also known for his expressive, truthful portraits. These paintings suggest the decadence of the fin de siècle period of which they belong. In Chase’s time, John Singer Sargent was the only other American artist to surpass him in the genre. Unlike Sargent’s own European beginnings, Chase’s early career as an artist began in Indianapolis, MN where he painted a handful of portraits. As art historian Ronald G. Pisano argues, Chase’s early paintings are average, with no apparent evidence of remarkable talent. After briefly studying at the National Academy of Design and a stint in the portraiture business, Chase left to study in Europe. It is at this moment in Chase’s life that his artistic genius was awakened. The Royal Academy in Munich was a fashionable alternative to the Parisian art world and attracted many young American artists, including Chase. The Munich School is known for its predominant use of dark colors and sober tonality. Moreover, the availability of works by the Old Masters in Munich such as Peter Paul Rubens, Anthony Van Dyck, and Rembrandt van Rijn provided sufficient study for the young artist. Consequently, Chase’s body of work from this period reflects the varied aesthetic currents that were circulating in Munich at the time. His painting of 1877, titled Ready for the Ride is a representative painting from this period. A full-length portrait of a woman in her riding clothes, rendered in lush tones, references the works of earlier Masters, such as Diego Velázquez and Frans Hals. At the inaugural exhibition of the Society of American Artists in 1878, this painting helped to establish Chase as an important American artist. In the years following Chase’s return to the States, American artists were emulating the fashionable currents of European art and in turn, producing little work that was original. However, ten American painters led by Childe Hassam were eager to revolutionize American art. Together, these artists firmly believed in the idea of creating a new National art, yet they each aimed to produce works that were reflective of the “new style” of European art. Even before Chase was invited to join “The Ten,” his painterly style was shifting towards Impressionism. A master handler of light, Chase’s still lifes and portraits of this period are elegant and spirited. His later paintings reveal Whistlerian influences and generally contain a more limited palette than his early works. The influence of Impressionism can also be seen in his landscapes of this period, which are brighter in palette. 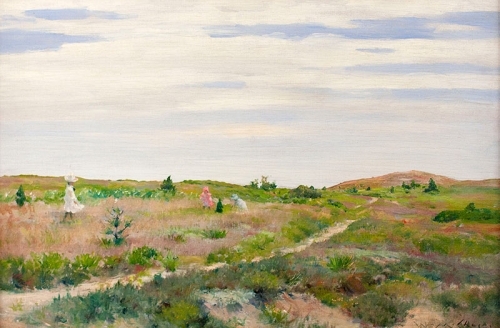 The lighter colors used in these landscapes can most likely be credited to his adoption of painting en plein air during the later years of his career. Chase stayed true to Impressionism for the remainder of his career and life. He did not take well to early modernism of the 20th century and was disappointed in the new trends on display at the Armory Show in 1913. Although Chase never accepted modernism, he did, in fact, influence the advancements of American art beyond the Armory Show. 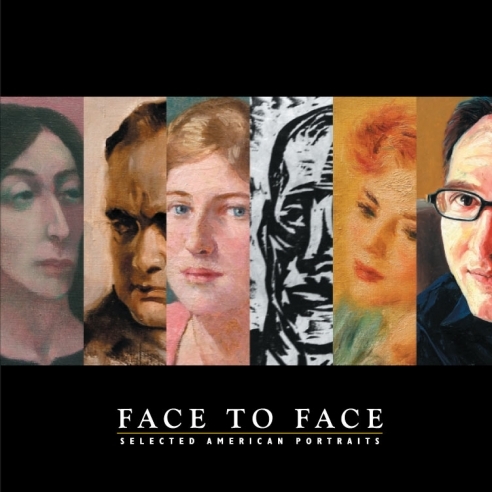 During his years as an instructor, Chase’s students included Georgia O’Keefe, Rockwell Kent, Charles Sheeler, Charles Demuth, Marsden Hartley, and Joseph Stella, among others. Moreover, Chase’s art school, the Chase School of Art (now known as Parsons The New School for Design) in New York is ranked as one of the top art schools in the nation and continues to educate aspiring artists to this day. 1. Bryant Jr., Keith L. William Merritt Chase: A Genteel Bohemian. Columbia, MO: University of Missouri Press, 1991. 2. Chase Centennial Exhibition, Commemorating the Birth of William Merritt Chase. Indianapolis, IN: Herron Museum of Art, 1949. 3. Gallati, Barbara Dayer. William Merritt Chase. New York: Harry N. Abrams, 1995. 4. Gallati, Barbara Dayer. William Merritt Chase: Modern American Landscapes. New York: Harry N. Abrams, 2000. 5. Pierce, Patricia Jobe. The Ten. Concord, NH: Rumford Press,1976. 6. Pisano, Ronald G. Summer Afternoons: Landscape Paintings of William Chase Merritt. Boston: Little, Brown and Company, 1993. 7. Pisano, Ronald G. William Merritt Chase. New York: Watson-Guptill Publications, 1979. 8. Roof, Katherine Metcalf. The Life and Art of William Merritt Chase. New York: Hacker Art Books, 1917. 9. William Merritt Chase. New York: Chapellier Galleries, 1969. 10. William Merritt Chase. Santa Barbara, CA: University of California Art Gallery, 1964. 11. William Merritt Chase: A Retrospective Exhibition. Southampton, NY: Parrish Art Museum, 1957. 1987 National Gallery Art, Washington, D.C.